This is one of those projects waiting for a ton of inspiration to complete. Start with one 8" Rider-Ericsson base, water pump and cylinder and go make the rest... I got this one from a friend about 5 years ago and it needed, as you can see, a lot of parts. I tried calling all over the country trying to find parts...nada...zip...goose egg! 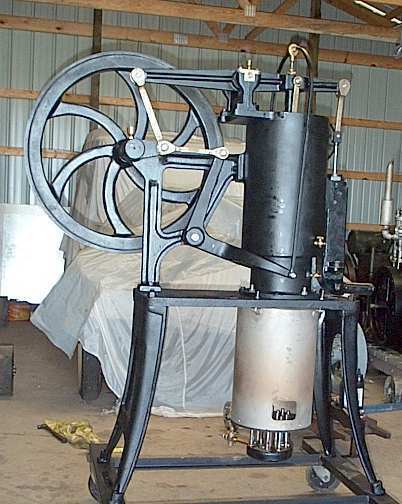 I am lucky that I have the really critical parts to complete this engine, good woodworking/patternmaking skills, and a foundry about an hour away. So over the 2001 holidays I will try to make most of them. The engine came from SE PA . I have a lot of photos and a set of quarter scale model drawings. I was able to locate the points and radaii to get the nice spoke shape. The cardboard template is used to get exact copies of all 4 pieces. 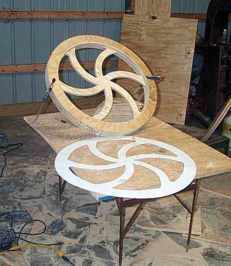 The center spokes are two thicknesses of 1/2 plywood with radiussed edges. 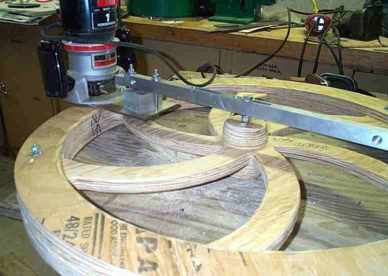 The outer rims are 3/4 plywood. 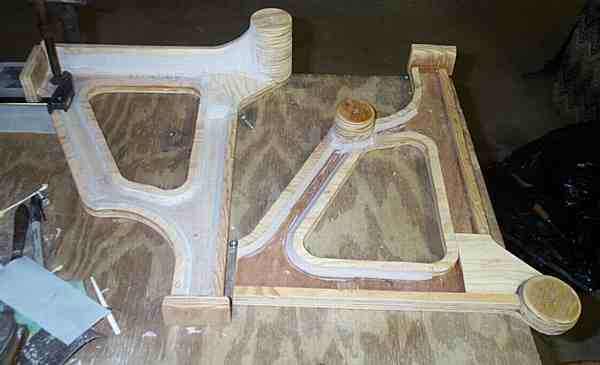 The pattern will be split into 2 mirror-image halves to go into the cope and drag. This still needs more work but I was really jazzed to get this done and I am pleased with the look. I still need to make the center hubs, pin the halves and put the draft in it. Some thin masonite will make the raised rim OD area and get the proper dimensions. Bondo will be used to develop all the corner radaii. Fixture I made to use the router to true up the OD and develop the draft angle needed to get the pattern out of the sand. Getting the center hubs on correctly was critical to having both draft angles meet along the parting line. 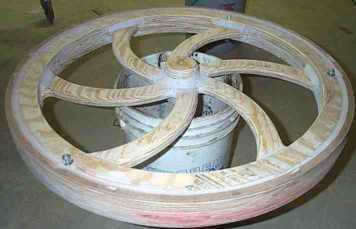 Now just lots of rasping and sanding to get the spokes shaped correctly. 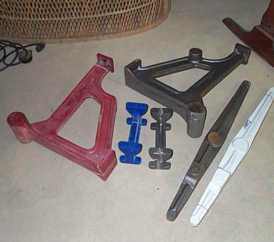 Patterns for the beam pivot (blue modelling wax) , the rocking beam, and the flywheel bearing support just beginning. Time for more filling corners with Bondo which worked well. 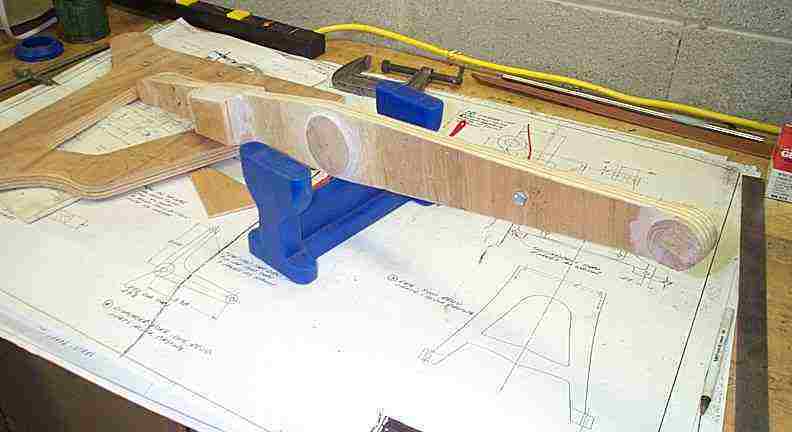 The blue rocker support will be split down the center on a bandsaw, pinned and it ready for the foundry. Almost finished flywheel pattern. Just need to final sand and apply polyurethane. 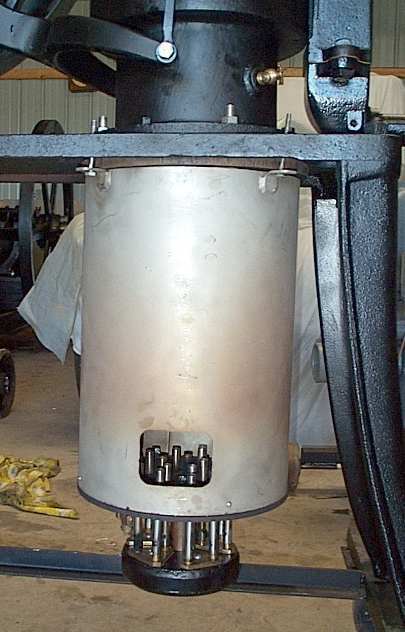 Patterm for flywheel support ~80% done. Lots of cutting and fitting on the engine cylinder and base to get it to fit... Buster Brown has helped me out immensely by mailing pix of his 8" engine which is apart plus communicating critical dimensions by phone and e-mail. Walking beam nearing completion. Had to add side ribs per pictures from Buster. Little more sanding and filling to do. The rocker arm support finished. 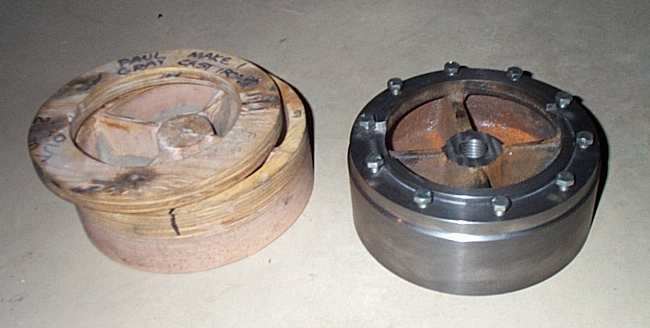 The piston pattern and finished piston. I made the tower screw into the piston. I used the DRO on the mill and triged out the coordinates to get the 10 bolt circle. Finished piston and tower. 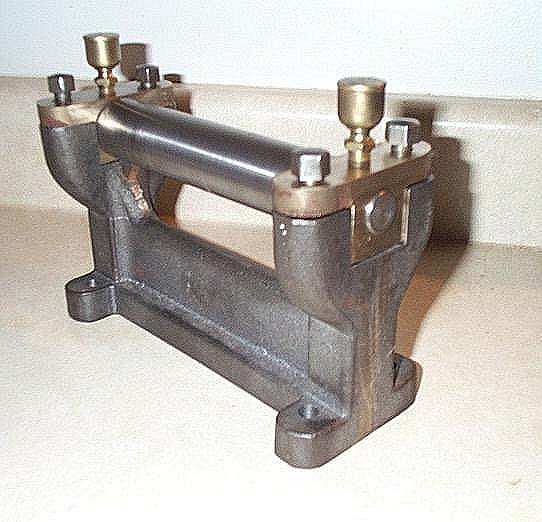 Remember- 8" bore; big hunk of iron! 11/13/2003- Well here it is! I had it running last weekend. Still some odds and ends to do. I have to make a better cart for it and install water hopper and plumbing; WHEW. All the links are cast brass like originals. 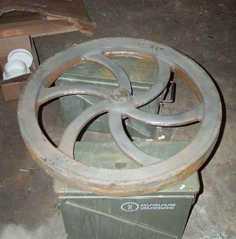 The stove is made from 1/16" Stainless sheet (needs paint). 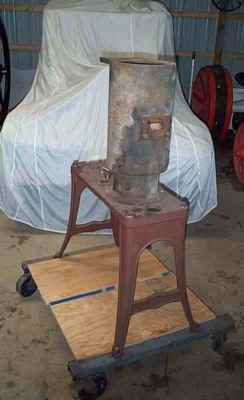 Picture of the stove. Check out the 15 little bunsen burners which heat the bottom end. All made from 1/2" stainless tubing . Will post some final pix by the end of 2003. Some cosmetics with the bolts; have to put on old style. Hope to do a writeup in GEM. 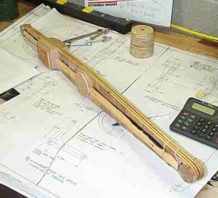 I wish to thank Buster Brown for his immense help with dimensions on this project; couldn'a done it without him. 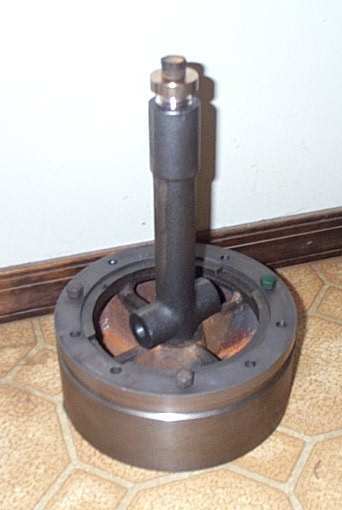 Also- George Coates Sr. (stuff which would not fit in my lathe), Dave Reed (helped me broach the flywheel and sundry odds and ends) and John Rex for his helping me get pix of the burner and stove. Thanks guys- this is what makes this hobby so enjoyable!